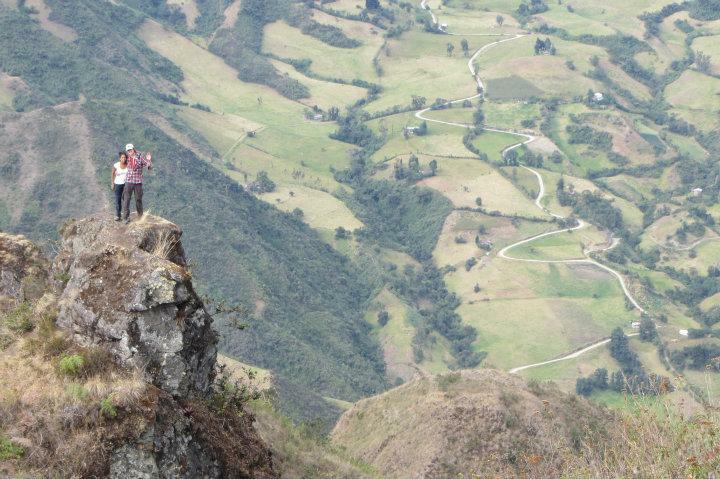 Mike: Alicia, Sandra and myself headed up to Riobamba which is a small town in the middle of the country. We hadn't heard great things about the city itself, but we had a trip planned from there. In the run up to getting this sorted, I had been emailing the company and very confusing it was too. They didn't seem to understand my questions or answered un-asked questions. They even sent Sandra numerous odd ones (and she writes in perfect spanish!). All of which didn't exactly fill me with confidence. The trip though was to the lost pyramid, an old hillside pyramid that was only discovered in 2003 and dates back to something like 2400 BC. We arrived in Riobamba, again without accommodation, our first stop was to meet up with Wlady from the tour company to ask our questions and pay for our trip. In person, he was not nearly as confused as he sounded on email and it filled us with a little more confidence. We were told about a cheap hotel near by that was $7 a night. We checked in there and although it was $7 for a reason, the fact it was so cheap didn't really bother us. We had a walk around town that day and Riobamba, although not exactly pretty, wasn't as bad as we thought. We found a nice resturant to eat at and got an early night. In the morning we got up and straight out to go to the pyramid. We met our guide who was accompanied by an intern from the US, Zack, at the office and jumped into Wladys car, he then took us to the bus station where we loaded everything onto one of the local buses and headed, back along the same road we had came in on the day before. When we got off the bus we were met by a pickup truck taxi who would take us about an 1 hour to the start of the mountain. Not before chasing after the bus though as in the hurry to take all our random stuff off the bus before it pulled away (they don't like hanging around) an extra bag was taken from the storage area. So we had to catch it up and give the bag back. When we got to the starting point of the mountain there was another group of people already getting ready to set of. We grabbed our stuff; Alicia and I were only carrying our day sacks, but Zack and our guide had massive bags filled with pots and pans, food etc. It was a bit of an odd situation as our guide was a young chap (later we'd find out he was only a tourism student) who couldn't speak English that well. Zack was a outdoor recreation student from America who couldn't speak any Spanish. So what little information we did get on the way up about the site would have to be translated by Sandra. The way up was still a steep walk for around 2 hours in blazing sun. We did take regular breaks, but our guide and Alicia were struggling. The guide because of the weight and Alicia because of the heat. Luckily Sandra was on hand to give out some advice. After around an hour and half we reached a big stone which we were told was where they used to sacrifice virgins. Sandra, Zack and I climbed up on the rock for some nice views over the valley. We continued onwards but Alicia was really struggling with the heat and the walk. At the top there were already a couple of people that'd been camped there for a day or so. 2 Irish guys and 2 locals. They enjoyed forming a little drum circle and playing their instruments for hours. We just crashed out at the top though. Our tents were following us on a donkey a little later. So for now we didn't have anything to do but chill out. Alicia had a sleep in one of their tents (Alicia: Whilst the Irish lads continued to smoke over me), at least it was some shade. Whilst she rested Sandra and I went for a bit of an explore round the top of the mountain. We were a little disappointed to hear that there wasn't actually any ruins to see. Infact the mountain itself was the temple. Undeturred we went looking for something that we could say was ruins, we did see some terraces carved into the side of the mountain and found a nice rock to sit on. So we sat on the rock over looking the valley and watched the many humming birds fly around in sun. When we headed back it was around 5pm and the tents had been set up for us. Alicia was up and about so we decided to make dinner. The guide pulled out a big food included a loaf of bread, pasta, mincemeat, sauce and a camping stove. Turns out the guide didn't know how to cook pasta, so after he asked a few questions on how to do it Alicia and Sandra just took over. It was easier that way. There was a lot of food, but we just managed to polish it off (with a little help of two dogs that follow tourists up to the to in the hope of getting food). After dinner the sun started to go down so we all looked over the valley below that was a sea of clouds and. It was really special being above the clouds looking down and as they turn from white to various oranges and reds as the sun sets. After a few hours watching this we get some extra layers on and sit around a campfire the hippy-types have started whilst they continued to play their music. We watch the stars which are incredibly clear. We see shooting stars, the Southern Cross, the Milky Way and can even see satellites passing across the sky. There are a few lights below us around the valley (we have a 360 degree view) from small houses and villages reflecting off the clouds and in the distance can see lightning. Later in the evening the 2 Ecuadorians put down the instruments long enough to offer us a taste of their traditional Ecuadorian drink made from Cactus called San Pedro. It didn't taste great, but it was nice to try. Apparently in higher doses it's a hallucenagenic (clearly the reason they had it), we didn't have enough, however Alicia was convinced she heard heavy rain through the night when there was none. Spooky. Alicia, Sandra and I squeeze into our tent around midnight (Alicia: Not before a cheeky game of 20 questions) ready to head down tomorrow. The next day we had some breakfast, packed up and headed down the mountain. The trip down was fairly uneventful. It took us a lot less time to get down than it did to get up. We jumped into the pickup truck, then bus and headed back to Riobamba where we were met by Wlady. We collected our stuff from the office and head back to our to the cheap hotel for a shower and a nap. Later in the evening we all go out for a meal in a pizza place that was recommended in the Lonely Planet guide and then go to "Abbey Road" a bar that Wlady owns for a drink or two and to meet up with the guide from the trip and Zack. Whilst we talk, Sandra finalises her trip to the jungle for the next day and we discuss with Wlady ways we can get to Chimborazo ourselves, how easy it'll be, equipment we'll need etc. Wlady says it's do-able, he gives us some bus times but we need warmer equipment than we have and because the next day will be Sunday he doesn't seem that keen to rent anything to us. Lucky for us Zack jumps in and says he'll just lend us all the equipment we need, very nice of him considering some of his stuff was worth a lot of money (i.e. a full single person Goretex shelter) and we barely knew him. In the morning we say our goodbyes to Sandra and meet up with Zack to collect his stuff, including a really thick sleeping bag and the Gortex liner. We pack for the day including all the warm stuff we can find. The plan is to get the bus over to the mountain, we'll pay $10 to get into the park, pay $10 to stay the night at the top and bus it back. This plan doesn't get off to a good start as at the Riobamba coach station, we can't find the bus Wlady was talking about and no one seemed to be able to put us in the direction of any bus that was going that way. By complete chance I overheard a couple having trouble with the same thing, after introducing ourselves we decided to share a taxi over, not ideal as it was $15 each, but better than not going. We took the trip with the middle-aged couple from Australia, (the woman was actually Peruvian, but moved to Oz to work in mining). They talked about how much they loved hiking, hikes they have done before and how she was a tour guide on the Inca Trail for a time. Along the way the driver stopped a few times to get pictures of the imposing Chimborazo in the distance which was a nice touch. We arrived at the park just before midday and we stood at the bottom of the national park looking out over the baron, dusty land leading up to the snowy peak of Chimborazo, that was so high that because of the Equatorial bulge it's the highest point anyone can walk to the sun, even higher than Everest (despite Everest being higher in actual altitude). To our suprise we only need to sign in and it's free to walk up. So we sign in and head up the the road towards the mountain, the unsealed road was only carved out of the land making it pretty dusty and as we climbed, the landscape looked volcanic for as far as the eye could see. Not far up the road some guys in their car asked if we wanted a lift, nice of them, but we prefered to walk. They then stopped the Aussie couple we got the taxi with a little way ahead and to our amusment they got in (so much for their love of hiking). Clouds almost always covered the top of Chimborazo, so as we slowly ascended we took our chances to take pictures. We followed the road most of the way as we could have easily have gotten lost, but we did venture off the beaten track once when we saw the road leading in completely the opposite direction than we wanted to head. We met up with it again, but reckon it knocked another 30 minutes off our walk. There was little for amusement on the way up; the odd large volcanic rock laying around, Vicuñas (a Llama-like creature that we occasionally saw wandering around), and we continued ascending slowing, taking regular stops to take on water, eat (Alicia: a couple of our rationed cookies we'd managed to pick up at a petrol station on the way), and add/ remove clothes. The air was cold with a biting wind, but walking was hard work, so we got warm quickly and didn't want to sweat, so it was a case of regularly putting gloves, hat and llama jumpers, then removing them again. When we got near the first refuge it started to snow which added to the atmosphere of the place but as we got higher we could feel the altitude making it harder to breathe. At the first refuge we met up with the Aussie couple by chance, they told us that there was a lake hidden at the top and hot chocolate at the second refuge, but they were waiting for their lift down so we decided to try and make it all the way to our destination, the second refuge, the last stopping point before the top located at 5,000 metres above sea level. From the first refuge to the second refuge was only about 800 metres, but this took nearly as long as getting up from the bottom as the path was a lot more direct heading straight up the mountain. On the way we passed a large number of memorials and gravestones of varing ages and nationalities which made us take in how dangerous climbing this mountain could be. We had to stop a lot on the way to the second refuge, Alicia in particular was finding it difficult to deal with the steep incline and the constant breathlessness, but we took it slow and steady stopping every 5 minutes or so to gather ourselves and then head up a little further. It was hard, hard going. We finally reached the second refuge and was happy to get into inside, although it wasn't exactly luxury, it was a basic concrete building with wooden benchs on a stone floor, an (inexplicably) unused fireplace and a small kitchen. Happily though, they had space for us to stay and it was free! We put our stuff upstairs and choose our bed out of a large line of bunkbeds. Before we went for an explore we had a cup of tea and a couple of pieces of plain bread bought from the kitchen (we didn't really bring any food with us - only a pack of instant noodles each which we'd have later on for tea, a six-pack of cookies for breakfast, plus hot chocolate and milk powder). After we had gotten a little warmer we headed outside to the snow covered landscape surrounding the refuge. We found the lake hidden over some hills, walked up a little higher and admired the different coloured volcanic rocks and the messages people had written by placing them each in the snow or bare patch of land. Night was falling by this time and we headed back to the refuge. When we got back we found all of the tourists long gone and we were the only ones left. I thought that it'd be full of climbers and groups getting ready to start their attempts at the summit, but we were literally the only ones around. We later found out there was 1 other guy but he was asleep as he started for the summit at 11pm to then climb throughout the night (the ice being a bit more stable when the sun isn't out). It was eerie being the only tourists around, but there was one worker who was staying in the refuge who was the person who looked after the kitchen, but he had his own room and no English, so communication was limited. We played some more Marvel Top Trumps, ate our instant noodles and eventually turned in. It was frickin' freezing at night! As soon as the sun went in the already cold temperature dropped dramatically. Alicia had the thick sleeping bag and I used the liner and her sleeping bag (taken because it was warmer than mine) and the Goretex liner. Alicia managed to get a little sleep but I had a really rough time with it. I couldn't stop shivering, even with all of my clothes on and all the liners, at one point I started sweating, but still shivering quite voilently. Breathing was also difficult. As the body goes to sleep your breathing slows, but at that altitude you need more oxygen, so on the rare occasion I'd start to drift off, I'd have a feeling like I was falling and wake with a start. Early in the morning Alicia woke again (she had problems sleeping too, but luckily not as bad) but stayed awake with me as I couldn't stop hyperventilating. It really felt as though something was restricting the air going into my mouth, every time I tried to calm my breathing down, it'd be followed by involuntarily hyper-ventilating even more. We tried to play the name game to take my mind off it and tried to keep me warm. She really took care of me. I did wander outside at one point to use the loo (handily located in an out house) and the stars were fantastic at that altitude, the best I'd seen so far, but I really couldn't enjoy them because it was pitch black and way, way too cold to stay out in. Eventually morning came, I'd been looking at my watch for the last 4 hours waiting for the sun to come up and listening to the same 2 relaxing songs on my iPhone for practically the entire time. I was happy to be able to get up and about and start the day. We were both extremely tired, but now we could at least get up and start heading down the mountain. The worker said (or so we thought) he'd give us a lift down the mountain from the first refuge, which by this point would be welcome. We hung around for him to get ready, then waited at the bottom whilst he talked to colleagues, then dissappeared inside the first refuge. The next time we saw him he was riding past us on the back of a motorbike......something clearly got lost in translation. A quick look at our watch said we only had 45 minutes till the next bus, then it'd be another hours wait till the next one. Keen to get home we walked quickly down the mountain, occasionally breaking into a jog with all our stuff. This time we went straight down ignoring the road until we got closer to the bottom and it got a bit more hilly, so it was easier to follow. We got to the bottom, found one of the workers, checked out and found out that the bus stop was just on the side of the road. We waited a bit then saw the bus, which continued to sail passed us. It was full, meaning we would have to wait another hour and that one could quite easily be full also. We waited around an hour and a half by the side of the road in the middle of no where when a tourist day-trip group in a big coach pulled up and said get on. We shouted to the driver "Riobamba?" he replied with a hand jesture meaning get in. I repeated, "Is this going to Riobamba? ", but only got the same thing. We hopped on, happy to be on our way, in the warm and for free. It was very quickly apparent to us that it was an Italian tourist group and our Italian is worse than our Spanish. But they tried to involve us in conversations, we still couldn't gather where we were going though until later. Later, we would find out that they weren't going to Riobamba, and that they invited to drop us off at the turning or to travel on with them to this random place we'd never heard of, then get a taxi back. Alicia was in the process of looking through an Italian Lonely Planet trying to decypher where we were heading when the bus stopped in the road and asked if we where staying or going. We didn't know, but we made a snap decision to get off. As we watched the bus pull away we were left in the middle of no-where (again) on the side of a large road with no idea where we were or which way to walk. With no one around to ask we just kept walking along the road, nothing yet, so we walked some more and a bit more. A couple of KM's down the road with no idea if we are heading in the right direction we reach an intersection that we recognise and there is a local bus going to Riobamba over the other side. We jump on and finally relax. The bus costs us $0.25 each, bargain. We got back to Riobamba, gave our stuff back to Zack and thanked him again. Headed to a Chinese resturant for some food (finally!). After the food, we pick our stuff out of the hotel storage and return to the bus station to travel onwards to Quito.